I ♥ mittens, + my Adelboden-to-Kandersteg OD. – on my way: make it someday. 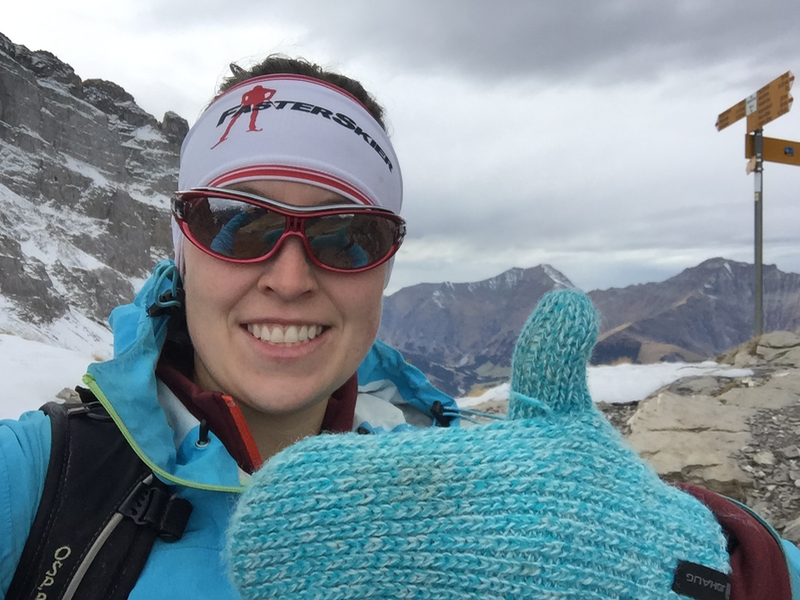 I ♥ mittens, + my Adelboden-to-Kandersteg OD. If you’re advertising something, you usually ask the best people in the world at using or doing that thing to endorse your product. Therese Johaug is a famous Norwegian skier who started a glove company. She has used that platform to sponsor some of her competitors, which is pretty cool. There are some fantastic ads featuring Sophie Caldwell, Jessie Diggins, and Liz Stephen – some of the best skiers in the world, who happen to be from Vermont and Minnesota. I am not one of the best skiers in the world. Yet, I would like to endorse Therese Johaug’s mittens. I consider myself to be a high-use mitten wearer. I have rigorously the product in a variety of punishing conditions. You don’t have to be an international star athlete to value good gloves – they are useful for lots of different jobs. And luckily, I have, like, a bunch of different jobs. And so I present: how a pair of colorful mittens saved my bacon a whole bunch of times. I acquired the bright blue, wool mittens in Norway in 2014. I was in the midst of my masters degree and took a whirlwind trip to race in the Birkebeiner and then cover biathlon World Cups in Oslo. As could describe most of the year spanning from October 2013 to October 2014, I was a shitshow. I got to Lillehammer and realized that I had only brought racing gloves, which would be totally inappropriate for covering World Cups in Oslo. Thin gloves are good for exercising, not so much for standing around. The Birkebeiner was canceled on the morning of the race (maybe actually an okay development considering how horrifically out of shape I was), but the day before I had perused the famous expo when I picked up my bib. Besides buying some panic-wax, I picked up these mittens. I think they are actually a size too small for me, but I was smitten. It was mostly the color called out to me, but I was happy they were wool, too. I have little brand loyalty, in general, and most of my gloves (a) have holes in them and (b) are what I was given for free, are what were on sale, or are what people left at my house (looking at you, neon yellow Roeckl gloves). In the end, even though I didn’t race I came away with something important. The mittens. One morning early in the week I went for a ski with Susan, and it was fantastic. Sunny, warm, spring in Scandinavia. Heaven. Race gloves, not mittens. Do you see the sky? It’s not blue. Oslo can get socked in with fog like you wouldn’t believe. At least it wasn’t actually raining that day. 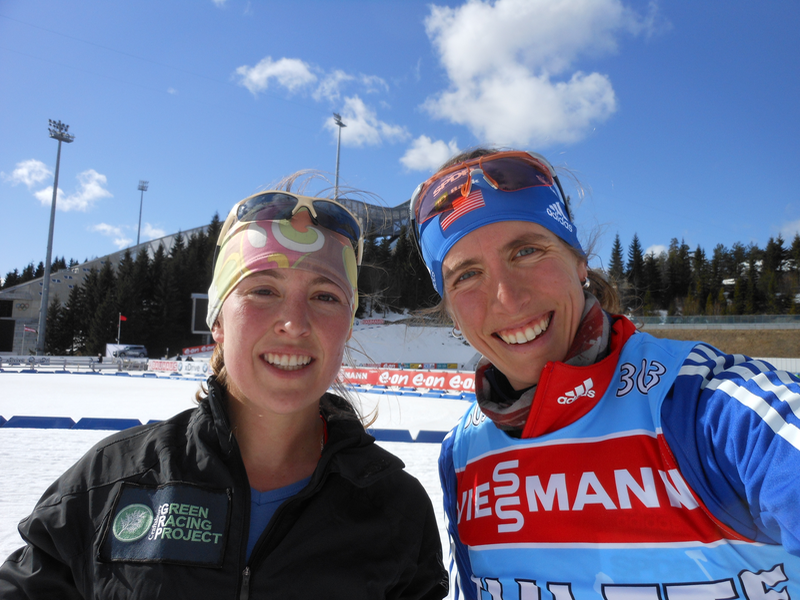 The last two days of the 2013-2014 biathlon World Cup season, mostly, were like that, only it was raining. It was totally miserable. I didn’t take a single photo of the races because I don’t have a fancy cover to keep my camera, which costs as much as a month of (Zürich) rent and was a gift from my grandparents which I couldn’t replace, out of the wet. Here’s the thing about reporting at a ski race: much like coaching, you’re mostly just standing there, possibly with intense bouts of sprinting from one part of the course to another in between. When you want to take notes or hit the “record” button on your phone or voice recorder, you have to take your gloves off. It’s unavoidable. And like most skiers, I have terrible circulation after years of exposing my hands to the cold. So mittens are much better than gloves, because when you slide your hand back into your mitten all your fingers are together, warming each other up, in this case encased in wool and fleece. You warm back up faster. Especially mittens which you can also fit handwarmers inside. 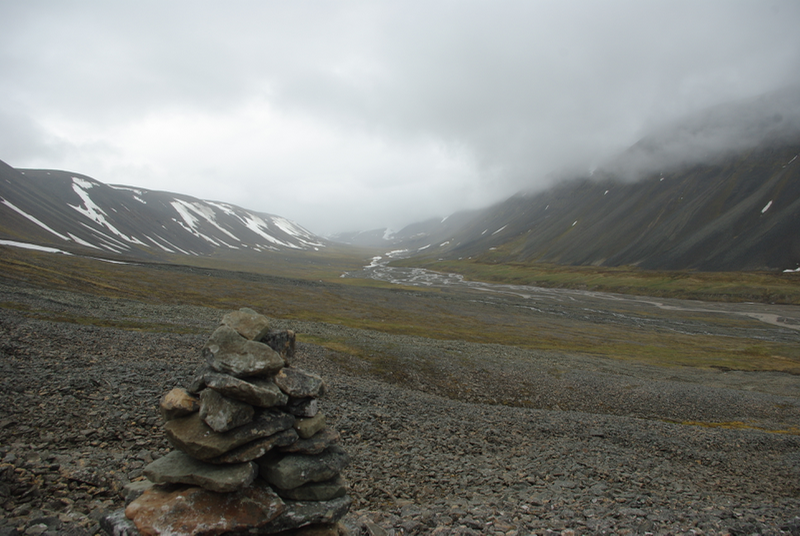 I went about the spring of 2014 working on writing science papers and preparing for my summer of fieldwork, which was to be done on Svalbard, an Arctic archipelago belonging to Norway. Just how far north is Svalbard? Think of some northern cities. Fairbanks, Alaska, is at 64.8ºN. 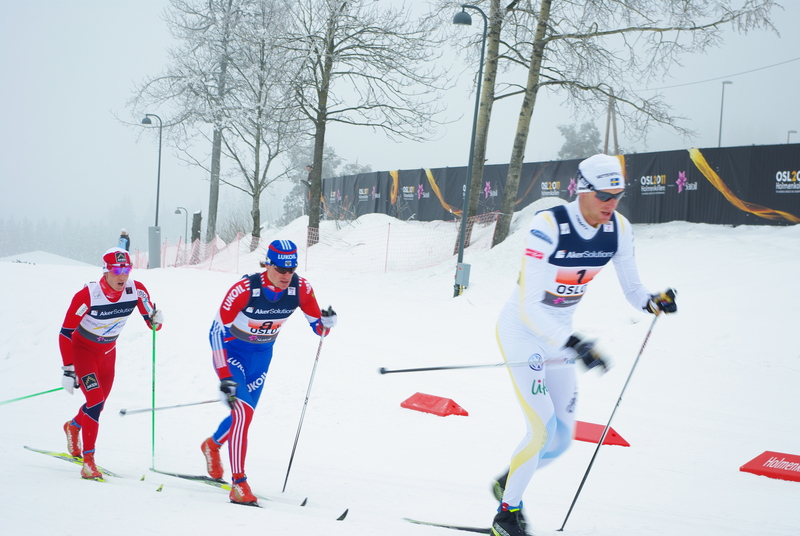 Östersund, which Sweden bills as its “northern sports city”, is at 63.2ºN. Trondheim, the northernmost Norwegian city you are likely to have heard of, sits at 63.4ºN, while Tromsø, the northernmost city you’ve probably heard of if you’ve actually spent time in Scandinavia, is at 69.7ºN. Longyearbyen, the administrative center of Svalbard, is at 78.2ºN. Working in the valleys is freezing, even in July. The daily mean temperature is 5°C (about 40°F), just above freezing. 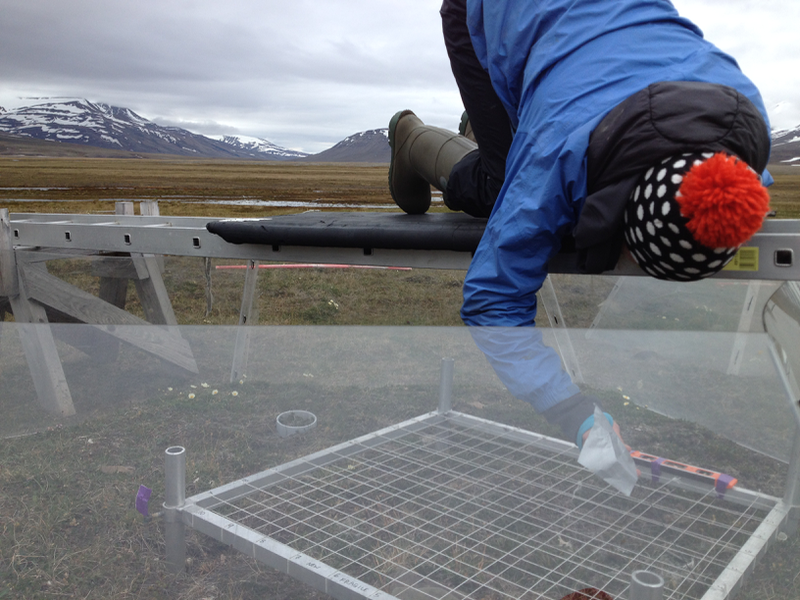 You have to wear rubber boots to walk out to the field sites because the ground is completely saturated and marshy, as a result of the permafrost. You wear double layers of wool socks to try to counter the fact that rubber boots usually make your feet colder, not warmer. Worse, the wind rips its way up the valleys from the water. That water is, in case you missed it, the Arctic ocean. You wear five layers underneath your raincoat, and then pull the hood over your head. I was happy to be in such a cool place, but my field assistant Helen and I realized that basically, we just weren’t going to have summer that year. Surveying tundra plants means sitting as still as possible. The tundra is fragile and trampling can do major damage to plants, so you can’t step on the tundra in the plots you’re studying in. Instead, we would hang off of elaborate ladder-and-sawhorse contraptions and count the plants we saw at each point. The blood would rush to your head as you hang upside down. And up on the ladder you were even more exposed to the wind. If you weren’t counting, then you were sitting there recording data on a clipboard. Also cold. And if you had a hat and your raincoat hood pulled up, sometimes you couldn’t hear the other person telling you numbers. We’d switch back and forth on the tasks so we could warm up whatever parts of our body were coldest in a given job. Did I mention, thank God for mittens? 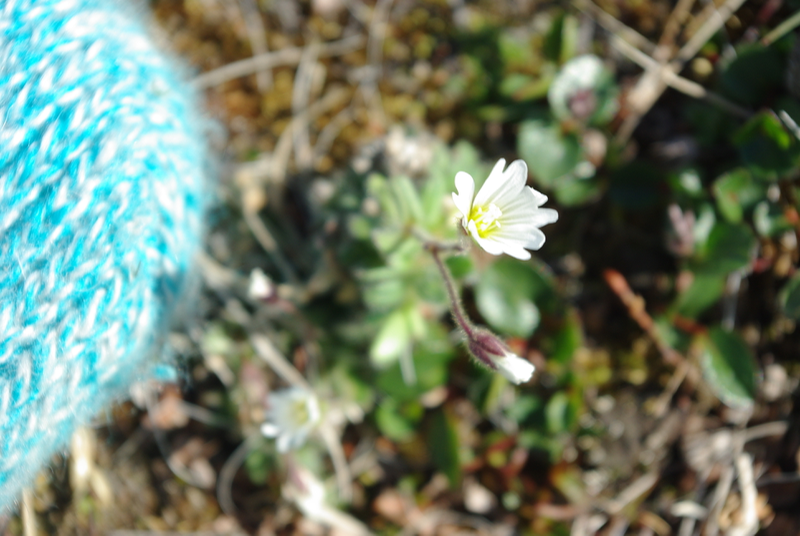 Cerastium arcticum flower on a sunnier day. Now that I’m doing fieldwork for my PhD in Switzerland, I still love mittens. I work in streams and this time of year, plunging your hands into the water to collect some dead leaves or live invertebrates is pretty chilly. Sometimes I let out a little shriek. I like putting my hands back somewhere warm afterwards. 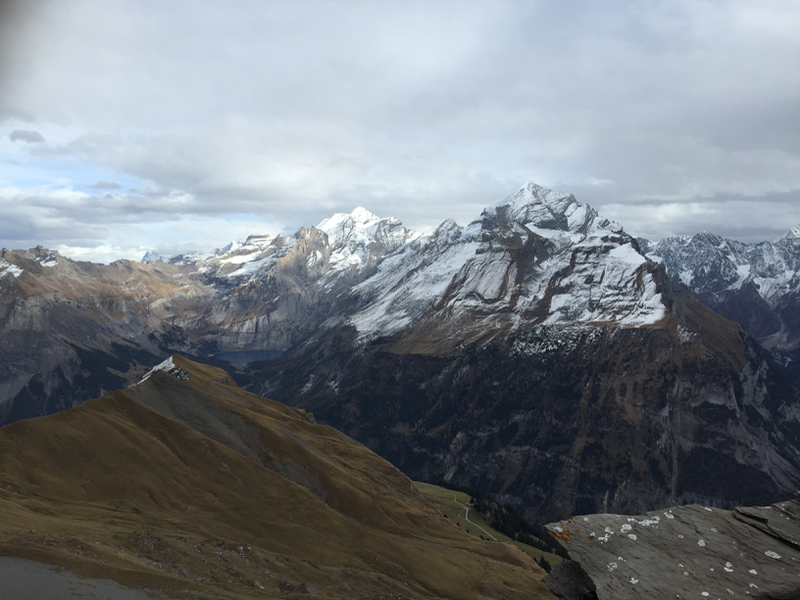 Recently I took a hike from Adelboden to Kandersteg in the Bernese Alps. All summer I have been sticking to places more accessible from Zürich: cantons Glarus, Schwyz, the northern tip of Graubunden. I decided that before winter came, I would take one day where I sucked it up and spent the extra time on the train to get to somewhere new. I picked this hike because it was in a super scenic region, and the bus and train connections weren’t so bad (about 3 hours from Zürich). The national hiking route Via Alpina leads through the area. There are so many places to possibly hike in Switzerland, sometimes you have to just put your finger on the map and pick something. I knew it would be beautiful. This feeling was intensified when I got on the bus to Adelboden and saw that I was the only one under the age of 65. If Switzerland’s retired were headed here for a day trip with their rucksacks and hiking poles, it was probably pretty scenic. A farmer shouted at me as I walked up through the outskirts of Adelboden. Hindsight is 20/20, so I’m pretty sure he was probably shouting that the pass was snowy and I looked totally unprepared. At the time I thought, “thick-accent-Swiss-German”, smiled, and waved. It has been, shall we say, temperate in Zürich. But this was the north-facing side of a 3,000-meter (nearly 10,000 feet) mountain. Even though it was only early November, there’s snow to be had. I had arrived in my trail running shoes, some ski spandex, and with a small backpack. 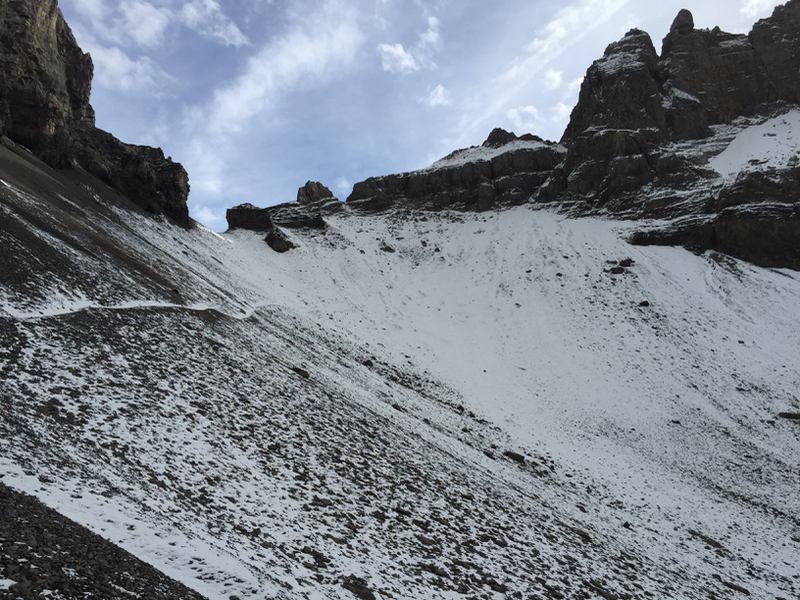 I looked at the final climb to the pass – which is even steeper than the section I had just came up, nearly 60º, and covered in snow. 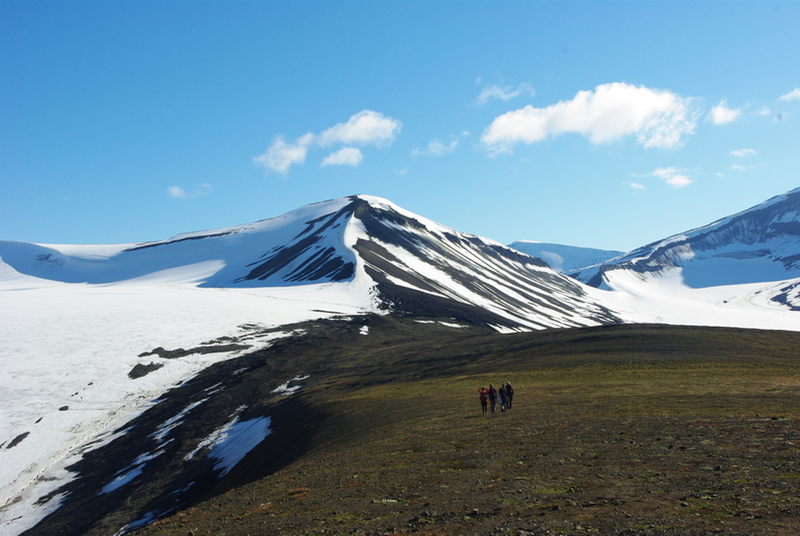 I pictured slipping as I dug my foot into the snow, and sliding down the scree field. In classic idiot fashion, I had not told anyone where I was hiking, and I was alone. I had seen only one other man on the trail, and he had turned around long before. But I had come this far! I estimated that the sketchy section would only take me 15 minutes of careful way finding, and pulled on Therese Johaug’s mittens. That allowed me to use my hands as well as my feet to crawl my way through the white stuff. Sticking my hands in the snow would have sucked; I would have been way more likely to fall if I hadn’t been confident that using my hands wouldn’t lead to several hours of frozen misery. Things were dicey at the top but I made it. I was rewarded with incredible views from the top of Bunderchrinde pass. I sat and ate my lunch looking at Eiger, Jungfrau, and Mönch in the distance. My only company were the Swiss fighter jets training overhead. Click the panorama to enlarge. Days like these are when I’m thrilled to live in Switzerland. And have a good pair of mittens. People badmouth mittens, saying they look silly and don’t have functionality. I beg to differ. Mittens are da bomb. And yes, it’s more or less a coincidence that I picked up those mittens. Would I have been happy with some other pair? Certainly. But thanks for the wool mittens, Therese. Keep making things in bright colors.